Christ died for our SINS according to the Scriptures, and that He was buried, and that He was raised on the third day according to the Scriptures. Knowing this, that our old man has been crucified with Him in order that the body of SIN might be annulled, that we may no longer serve sin as slaves. There is too little emphasis and understanding on the difference between SINS and SIN. Both are fundamental problems in the life of a believer, but there is a solution to both. It is vital that we come to an understanding of the difference between SINS and SIN. SINS are individual transgressions carried out against God, in thought, word or deed. SIN or the SIN NATURE is an inherited power within that causes us to sin against God We require forgiveness FOR our sins. We require deliverance FROM our sin, but both forgiveness and deliverance are found in the cross of Christ. 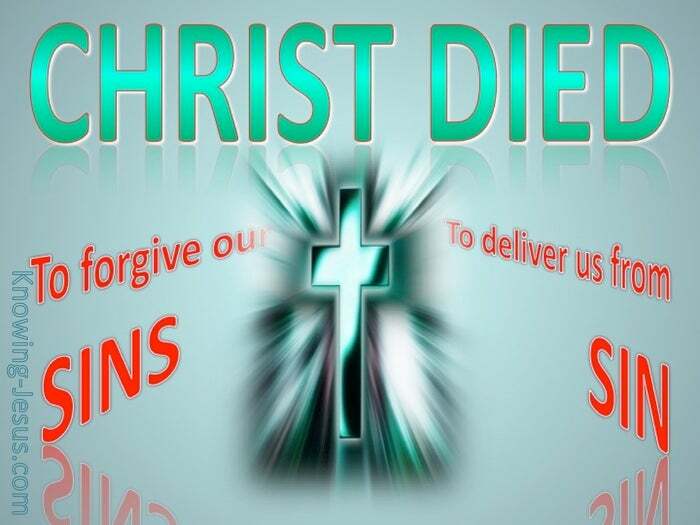 In 1 Corinthians we read that Christ died for our SINS – He paid the price for our sins. Every transgression in action or attitude are sins for which Christ died on the cross. Every sin we ever commit falls into the category of SINS – sins that we have committed. Transgression in thought, word or deed are sins against God, and need forgiveness. Sins are wrong actions we carry out. Sins are ungodly attitudes that mar our witness. When believers sin we should immediately confess that particular sin to the Father – and God is faithful and just to forgive our sins and cleanse us from unrighteousness. In 1 John 1:7 we read that the blood of Jesus Christ, His Son, cleanses us from all sin. Every sin we carry out is a violation against God – and it needs to be confessed. If we confess the wrong things we have done to God – He promises to forgive us. Then there’s the issue of SIN – the problem of sin; the principle of sin; the power of sin, Sin in the singular, has to do with the controlling power that sin has over our lives. Sin in the singular, relates to the sin nature – that was passed to all men via Adam. When Christ died on the cross, we were in Him – and our old self was also crucified. Our sinful self was crucified with Christ – so sin lost its controlling power in our lives. Christ gained power over sin and death in our lives, when He died and rose again, because we are new creatures in Christ we are no longer in slavery to sin. 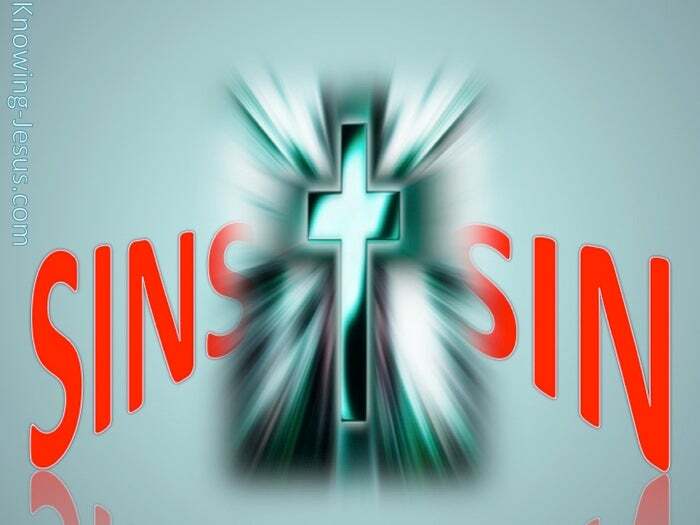 The problem, principle and power of sin in our lives was dealt with at the cross, because we were crucified with Christ – we are set free from sin’s vice-like power. We require forgiveness for our SINS – and it is PAID IN FULL. We require deliverance from our SIN – and it is PAID IN FULL. Both forgiveness and deliverance is found in the cross of Christ. 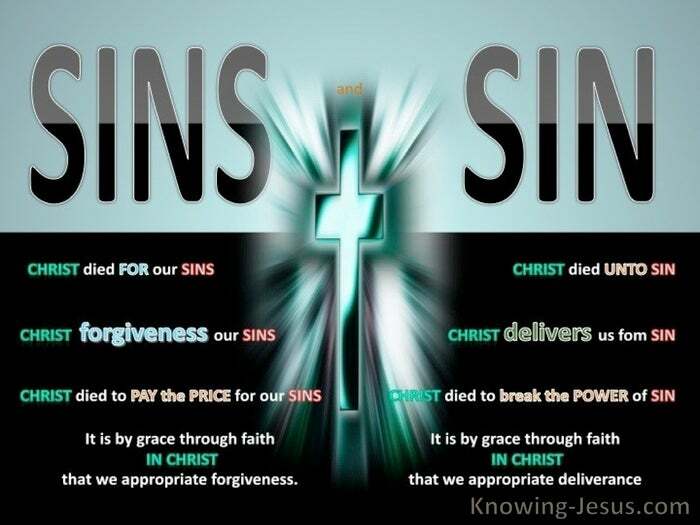 There are 2 fundamental SIN problems but BOTH are dealt with at the cross of Christ. It is by grace through faith in Christ that we appropriate forgiveness – of SINS. It is by grace through faith in Christ that we appropriate deliverance – from SIN.